Trigger warnings–those notices you may see before an article with upsetting information–can serve a helpful purpose in some situations. Abuse victims or people with post-traumatic stress disorder (PTSD) may be triggered by graphic sexual or violent content or imagery, and with “trigger warning” they can choose to stop reading. I see trigger warnings on a lot of OCD support pages, too, and although they’re posted with only the very best intentions–to save readers from hurt and pain–I don’t think they’re necessarily appropriate for those of us with OCD. Just a few weeks ago someone recommended the fantastic book The Imp of the Mind by Lee Baer, which is all about taboo intrusive thoughts, and a woman commented that the book contains lots of triggers. Yes, it does! But it also contains invaluable information that helps push people toward recovery. Life is a trigger for OCD. And avoiding situations that may trigger obsessions or compulsions is in itself a compulsion. The reason exposure and response prevention therapy is so effective is that it includes triggers–of course, they’re introduced gradually. When my obsessions were at their very worst, everything was a trigger. It was unbelievably painful. I tried so hard to avoid anything that might make me think what I desperately didn’t want to think, and that made it all worse. I couldn’t just stop going to the grocery store. I couldn’t stop going to work. I couldn’t stay in my apartment every day. My comfort zone became smaller and smaller until I realized I didn’t need a trigger to think a bad thought. It was all already there in my head, in my psyche. I had to stop trying to hide from the torture that was coming from within and learn how to face it. Believe it or not, the Internet wasn’t as ubiquitous back when I struggled so much with my obsessions as it is now. More specifically, social media hadn’t yet exploded, and you didn’t see people on their smartphones and tablets everywhere you looked. It’s such a part of daily life now that I think it’s important to realize you may run across something upsetting while you’re browsing. If you get too accustomed to trigger warnings, you may start to avoid everything that has one. I hate to use the term “slippery slope,” but I do think it could be an issue here. A few months ago I shared an article about Maria Bamford, a comedian who has OCD. One of my readers said the article caused her anxiety and she thought maybe she wouldn’t click on anything related to OCD anymore. My concern, which I shared with her, was that the article could have had a title like “Comedian Loves Making People Laugh at Home and at Work” and happen to contain lots of information about her OCD symptoms. If this reader of mine decided to start avoiding the obvious, like this article that was actually titled “The Weird, Scary, and Ingenious Brain of Maria Bamford,” then she may start to avoid the innocuous, just in case that contained triggers as well. And so on and so on. Let me know what you think. I know this is a tricky topic, and I’m glad to engage in a discussion about it. Let this sink in: Recovery from OCD is a journey, not a destination. 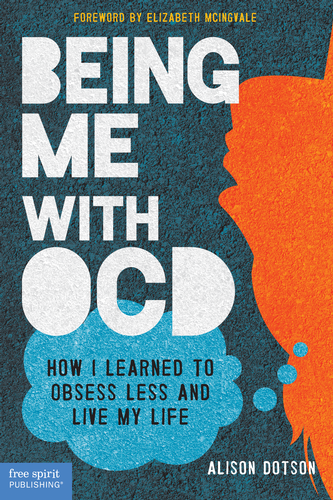 Since I’ve written a book about “how I learned to obsess less and live my life,” people sometimes ask me if I have overcome OCD or if I still obsess. The answer is that I don’t obsess like I used to, which sometimes feels like a miracle. But what makes life easier, and this long, winding road of recovery less treacherous, is that I realized years ago that there’s no such thing as perfection. If my goal were to be obsession-free, or to never, ever let a bad thought enter my mind again, life would be torture. Living with OCD–and not constantly battling against it–means accepting that I will have doubts. I will have bad thoughts. I will, from time to time, feel panic surge through my body because an old obsession has been triggered. It’s frustrating to have to continue to deal with this disorder, but I’ve come to terms with the fact that I do have OCD. I just do. Nothing will change that basic fact, but I can work to give my thoughts less power and to simply react to them rather than overreact to them. I’m not telling you all of this to make you feel discouraged. Quite the opposite! I want you to know you are a human being. You are imperfect. You will fail. (You must be thinking, “Wait, I thought she said she wasn’t trying to discourage me.”) We are all imperfect, whether we have OCD or not. Lay down the burden of trying to rid yourself of every intrusive thought you’ve ever had, or of never performing a compulsion again. Success does not equal perfection. Success means you’ve improved. Success means you’ve tried, and you’ll try again tomorrow. A few weeks ago I was babysitting my nephews. One of them wriggled so much as I helped him get his pajamas on that the pants ended up backward. That bothered me. The third time I asked, “Are you sure you don’t want to turn your pants around?” I really heard myself and knew I had to just let it go. It wasn’t bothering him at all–why was I stressing about it? When I started reading Rewind, Replay, Repeat by Jeff Bell, there were so many similarities in our stories I worried that he’d think I’d copied him if he were to read my book. Twice I even started writing emails to him to assure him that I hadn’t stolen his book idea–but I felt so ridiculous each time that I stopped writing and deleted my draft. I mean, come on. We both have OCD. Of course there will be some overlap! Yeah, Alison, you both wrote about seeing a psychiatrist. Big whoop. What kept me from telling Jeff this, and pseudo-apologizing to him, was that I could pretty much guess how he’d react. He’d either laugh or, in a very nice Jeff Bell way, simply refuse to reassure me that it was okay. Basically, I knew I was “being OCD” and didn’t need Jeff to tell me that. I could tell myself that just fine and save both of us some time and trouble. There you have it: A slice of life with OCD. I’m not depressed or obsessing every single day, and my obsessions aren’t dark like they once were. But I do feel anxious sometimes. I do jump to the most illogical conclusions. I do toss and turn some nights worrying about something I said, or didn’t say, and how I could make up for it. And this is all okay, because I’m me, Alison Dotson, and I have OCD–as well as a life to live.